Radon Levels in Ontario -- Is Your Home Healthy? Radon -- being an odorless, colorless, tasteless and in all ways utterly impossible to notice using any of the human senses -- is toxic and could be present in your home right now. 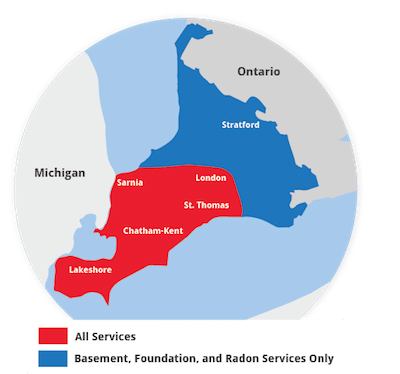 The radon levels in a home can be tested and mitigated by Advanced Basement Systems, your local radon specialist in Chatham, London, Sarnia, Windsor, Stratford, Windsor , Leamington, St Thomas, Amherstburg, Strathroy, Essex, Kingsville, Ingersoll, Goderich, Aylmer, Listowel, Hanover and the surrounding Ontario area. Contact them today for solutions to your home's radon problems. The Results Are In -- What Do They Mean? Radon is measured in becquerels per cubic meter (Bq/m³) and the smaller the number the safer you are. However, even what is considered "small amounts" of radon may not be all that safe. Regardless, most homes can be mitigated and the levels can be lessened to some degree. As a standard, Health Canada (HC) has defined 200 Bq/m³ as the "action level" for any indoor environment. This means that a test reading 200 Bq/m³ and above needs to be mitigated and the radon levels need to be immediately reduced. As long as your home is below 200 Bq/m³, you should have some peace of mind. However, Advanced Basement Systems wants to do everything possible to get the radon levels as low as possible. Contact Advanced Basement Systems today for more information. Maybe 3700 Bq/m³ doesn't sound all that bad, so 148 Bq/m³ can't be a problem at all. In order to understand the number, you have to understand the measuring system. Let's compare some figures. 37 Bq/m³ is equal to 2.5 cigarettes a day. 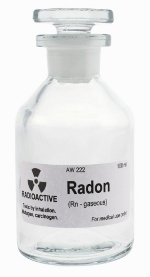 The radiation in a 148 Bq/m³ level of radon is equal to the radiation from 100 chest x-rays. Most hospitals actually only allow four chest x-rays each year. That's 1.48 Bq/m³ per x-ray and 5.92 Bq/m³ a year.